The Passion Of The Criss: Lest We Forget? 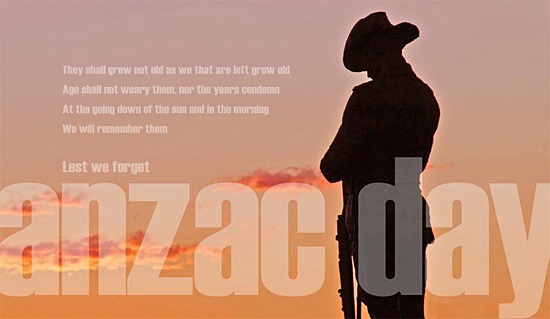 Today is Anzac Day. The day we stop as a nation and remember the men and women who have fort and died for our country. Fort for our freedom, and for the comfort we live in today. We thank them. Not sure what they would think about the world they have left. Probably turn in their graves. But the one thing we can take from the Anzac's is MATE SHIP. On this day I share with you a story of MATE SHIP. This morning I as I was making my way out of bed my mobile rang. I wasn't sure who it might be. Maybe it was child 1 realising that today is a public holiday and she would not indeed be able to get here with the bread and fish food that she forgot yesterday. Instead it was my dear friend. The one who only Tuesday drove me to physio, and to the bank and to the car yard so I could give them the cheque. The friend who laughed and joked with me. "A day out with me...DRIVING MISS DAISY"
I knew she had her brother's party on today. She had done so much for me already, but there she was, calling to check on us patients. "Do you need anything? Did your washing get done? Would you like me to pop in and do it for you?" I was about to say "Oh no, it's OK..."
But I stopped myself, and said "YES, That would be lovely. THANK YOU". I got up showered as I was at least going to be dressed, and was potting about the kitchen trying to fix some breakfast when she arrived. She came with a huge bowl of home made soup, Pea and Ham. Dinner for tonight. She gave me a book she had just read and enjoyed, as she knew I was bored. She washed my dishes, and washed my clothes. Changed the sheets on the boys beds, and made them. I don't think they have had a made bed in weeks! Made us all lunch, and cleaned with the boys their room. (Well she did the lions share) Scary really as you never know what could be under the bed? She hoovered the whole house too. "Go sit down Criss, I can handle this!" she said. I was feeling guilty and was trying to help. So I accepted this kindness, and sat myself down and started to read. It is a good tale so far, I think I will enjoy it. It wasn't long before a hot cup of tea was brought to my little side table, when child 2 heard the ice-cream truck. MR WHIPPY. He doesn't come past very often. Maybe 3 times a year. She took my boys and grabbed my wallet. I have never seen the ice-cream truck ever drive slow or stop to sell the ice-cream. If he did he would make a nice pretty penny as the children would delight in his sweet treats. Off they went. They couldn't catch him. Child 2 slowed them down trying to find his shoes. But she and child 3 raced down the road where they had seen him go, and then looked and looked. After a while they returned, hot sweaty, and empty handed. But I just could not believe how selfless this act was. How sweet. By then it was time for her to go and get ready for her party. As she left it dawned on me that this was true MATE SHIP. The true spirit of the ANZACS. We are not at war, but we have fallen, so to speak, and she wont let us down. It is what I admire most about us AUSTRALIANS. We don't let our mates down. When disaster hits, we rally. We do what little we can, and it all adds up. Never underestimate the smallest act of kindness. To the person you are giving it to it means the world. The ANZACS stood by their mates. At least this is something we haven't lost. I think that despite this being a very different world to 100 years ago, Mateship is still alive and strong within our country. I feel very blessed to have such a person in my life.